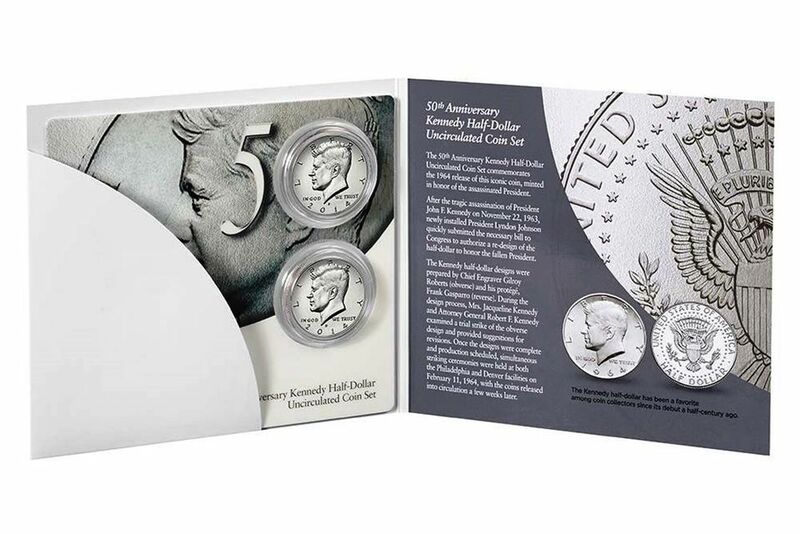 The special 50th Anniversary Kennedy Half-Dollar Uncirculated Coin Set was created by the U.S. Mint to commemorate the fiftieth anniversary of the minting of the first Kennedy half-dollar in 1964. What makes the coins in this set different than the regular circulation strike 2014 Kennedy half dollars is that the dies used to create these coins were created from the original sculptures crafted by Gilroy Roberts in 1963. Over the last fifty years the relief of the coin has been lowered and has a more flattened appearance. The coins in this set are of a high relief that Roberts originally intended. Each set contains two coins with an uncirculated finish, one from the U.S. Mint in Philadelphia, Pennsylvania ("P" mint mark) and another from the U.S. Mint facility in Denver, Colorado ("D" mint mark). The coins come packaged on a card and are encapsulated in a protective plastic holder. On the inside of the removable card is a picture of an original 1964 Kennedy half-dollar. The "50th Anniversary Kennedy Half-Dollar" logo is emblazoned on the front of the folder. The coins can be easily removed and added to your own collection portfolio. Obverse: The design shows a portrait of John Fitzgerald Kennedy, the youngest-ever-elected president. U.S. Mint Sculptor-Engraver Gilroy Roberts based this profile on a portrait prepared for Kennedy’s presidential medal. Roberts created his original 1964 design shortly after Kennedy’s assassination. Reverse: The design is based on the presidential seal and was done by U.S. Mint Sculptor-Engraver Frank Gasparro. It consists of a heraldic eagle with a shield on its breast, holding a symbolic olive branch and a bundle of 13 arrows. A ring of 50 stars surrounds the design, which gives this coin the distinction of having more stars than any other United States coin ever produced for circulation. Even though in some years circulation quality Kennedy half dollar coins were minted exclusively for inclusion in United States Uncirculated Mint Sets, quantities of these coins approached or exceeded one million coins at each mint facility. So far sales of this high relief 2014 dated Kennedy half dollars are only approaching 150,000. This is certainly on the road to becoming the key coin to an uncirculated Kennedy half-dollar collection. On November 22, 1963 President John F. Kennedy was assassinated while he was visiting Dallas, Texas. The nation was enthralled with their young president and his family living in the White House. His assassination was devastating to the country and many people mourned his death, not only in the United States, but around the world. His widow, Jacqueline Kennedy, was involved by helping select the design that would be used on the half dollar to commemorate her husband's presidency.